Drama, drama, drama. Anime is filled with sappy, romantic dramas. An entire subgenre, shoujo, is devoted to these stories. While shoujo is typically not my bag, several series such as Clannad and Fushigi Yugi broke through the typical shoujo pitfalls (re: shameless melodrama) and are among my favorites. ef: a tale of memories, unfortunately drowns itself in a self-impressed whirlpool of overdramatic sap. ef: a tale of memories follows two separate, but inconsequently connected teenage love affairs. By "inconsequently connected," I mean that ef could easily have been two completely separate series. One storyline follows the love triangle of young Hiro and two girls, Kei and Miyako. Hiro dreams of becoming a manga artist and devotes all of his time to this goal. Much to the chagrin of Kei, who tries to focus Hiro on school. The lifelong friends have a brother-sister, or more likely a mother-son relationship. Kei falls in love with Hiro. However, her affections are challenged by Miyako, a whimsical free-spirit who encourages Hiro's dreams--for better or worse. The other storyline focuses on Renji, a lonely bookworm who spends his days lost in the imaginary worlds of his books. One day Chihiro happens upon his usual haunt. Chihiro is a quiet girl who sports a mysterious eye patch and whose memory only spans the past 13 hours. She relies on her diary, which she re-reads every day, to remind her of about her life. After several awkward attempts at conversation and friendship, Renji decides to help Chihiro accomplish her unlikely dream of writing a complete novel. In that time, they develop an equally unlikely relationship. Frankly, I hated all of the characters. I cannot fathom why a boy would date any of the ridiculously unstable girls that inhabit this series. Nor could I understand why a girl would desire, much less tolerate the wimpy male characters. Beyond the fact that Chihiro's claim to a 13-hour memory is a silly story angle, she is one of the most incredibly pitiful and whiney characters I have ever seen in anime. With her 13-hour memory, Renji must endure her same ritual of self-pity every single day. 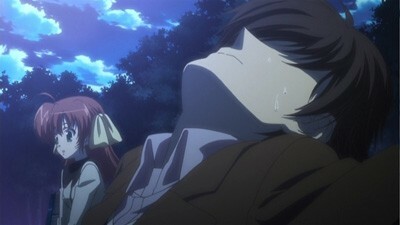 Chihiro also must constantly remind him that she has a 13-hour memory...because she has a 13-hour memory. For all of Renji's suffering, Hiro has it doubly worse. Kei is a clingy nuisance who cannot accept that Hiro views her only as a naggy little sister--or "friend" as he likes to call her. Despite the fact that they are not even dating, Kei has an emotional meltdown every time Hiro pays attention to the new girl in his life, Miyako. For a time, the free-spirited Miyako was the only likable character in ef's cast. Then, in the middle of the series, ef nuked her likability factor with one of the most egregious sins in dating: psycho voicemails. 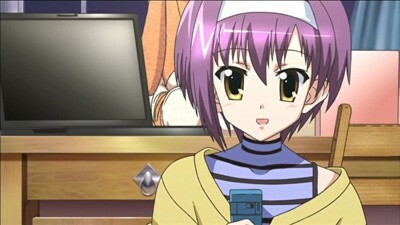 Miyako exposes herself as a complete lunatic through a seemingly endless chain of voicemails on Hiro's phone. 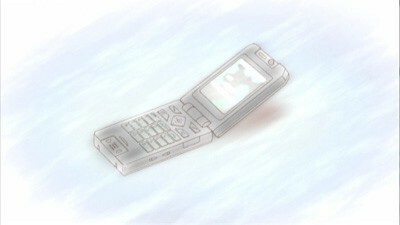 Director, Shin Oonuma, apparently felt that showing every one of these voicemail messages somehow enhanced ef's storyline. For half an episode, we are subjected to a still image of a cell phone lying in the dirt screeching with Miyako's passionately crazed rants. It was at this point that my mere eye-rolling disinterest for ef: a tale of memories exploded into a supernova of hatred. The two male characters in this series are largely interchangeable wusses. One writes manga, the other is a bookworm with a top knot. Hiro agonizes endlessly over whether to focus on his dream of becoming a manga artist or attending high school. I wasn't aware that the two choices were mutually exclusive. Hiro also ties these choices with the two girls who are fighting for his affection. In Hiro's worldview, Miyako represents freedom and following his dream. Kei represents the pragmatic choice of staying in school and living a safe, boring life--which forever dooms Kei regardless of Hiro's choice. It's obvious which path Hiro should take, but he's a coward who refuses to take a stand on anything, much less life decisions. He doesn't even seem aware that he has a choice to make for most of the series. Instead he leaves both girls dangling on a tenuous twig of oblivious indecision, which crushes their fragile emotions. Renji's personality is much the same as Hiro's. Nobody wants to watch a passive wimp fumble his way through a relationship built on a foundation of mutual pity. While Renji's motives smack of a desperate loner, he somehow breaks through Chihiro's Great Wall of Self Loathing to forge a relatively healthy relationship. Until Chihiro perplexingly decides that's too good for her pathetic little world. I suspect that if Chihiro had more than 13 hours of memories, she wouldn't give Renji the time of day. Every episode she has to re-convince herself that she has any feelings for Renji despite the fact that her trusty journal details her undying love for him. None of this even matters since their entire storyline is overshadowed by its laughable implausibility. Exacerbating ef's melodramatic storyline are the distracting and often confusing visuals. Sometimes characters change colors or take on a stylized manga appearance for no apparent reason. A dramatic flourish of visual artistry also accompanies every emotional event in ef. In one episode, Renji and Chihiro take a typically hyperemotional stroll on the beach. At an opportune moment, a tsunami rises from the ocean and nearly washes Chihiro away. Only it doesn't. The crashing tsunami is actually a pedestrian, 6-inch wave overdramatized to symbolize the weight of her emotions. These bizarre visuals pepper every episode and are a desperate attempt to artificially enhance the depth and meaning of an otherwise clichéd romance. In a series overflowing with sensationalized drama, if every little emotion comes packed with an extravagant artistic display, then it quickly ceases to be an effective tool. The result is a series that's an unaware parody of shoujo. 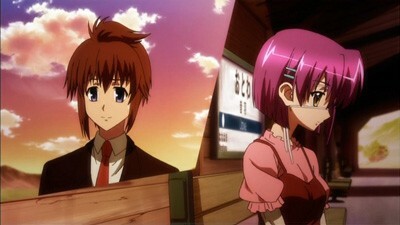 ef: a tale of memories is the type of anime series that I would have turned off well before the first episode ended. It introduces too many characters too early and they whine about their trivial lives too soon. My mere dislike bloomed into hatred and amplified as the series progressed. The story is ludicrous and in the world of anime, that's a monumental achievement. Even worse is the execution of this story, which is filled with information dumps and campy vocalizing of characters' innermost feelings. My advice to all prospective viewers is the same as my advice to the forlorn teenage characters in this story: RUN! Sound: The audio is presented in Dolby Digital 2.0 and includes both English and Japanese soundtracks. It's a barebones, dialogue-focused track that won't even begin to push the bounds of your surround sound system. The English voice acting is mediocre, but the actors were not given much to work with. Most of ef's dialogue is pure cheese that evokes memories of the atrocious 90's anime dubs. Who says "Tee hee" anyway? Video: The video is presented in 1.78:1 anamorphic widescreen. Whereas I complained about the use of striking visuals as a crutch for the abysmal storyline, these visuals were eye-catching. The image is bright and vivid and is a party mix of varying manga and anime art styles. Instances of prolonged stills and repeated imagery, however, make me wonder if the director didn't blow through his budget too soon. Extras: The special features include clean opening and closing credits and trailers for other Sentai Filmworks releases. It should be noted that the opening title song is catchy and probably the lone highlight of this entire release. Bottom Line: ef: a tale of memories is an overall aggravating experience for all but the most diehard of shoujo fans. Even having to write the title in all lowercase is annoying. The series is melodramatic mush filled with unlikeable whiners who would all benefit from simply ignoring each other. You can spend 288 minutes of your life much better than watching hormonal, angst-ridden teenagers dwell and cry over every facet of their mundane lives. The story commits numerous party fouls that entrench its status as one of the more frustrating anime series that I have ever had to endure. Skip It.